I've always been an avid reader. Over the years I've devoured the horrors of Stephen King, the cosy romances of Rosamunde Pilcher, got totally absorbed in the historical tomes of Sharon K Penman and chewed through any historical that covers the US, or Britain, with a particular leaning towards war stories. Oh and I have recently sampled crime: the wonderfully gutsy stories of Sam Shepherd by Vanda Symons. There is of course something missing here. Something that one of the members of my critique group (Mad Scribblers) writes and reads voraciously. FANTASY! 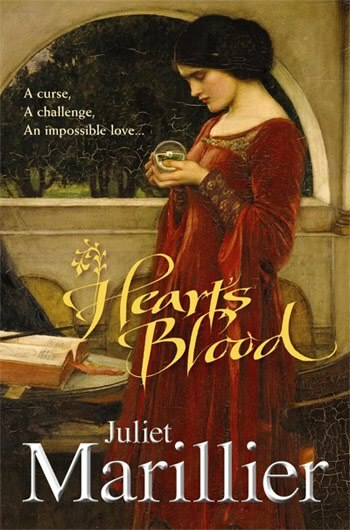 Feeling just a little skeptical, I turned the first page of Juliet Marillier's Heart's Blood and found I couldn't put it down. Rather a dark take on Beauty and the Beast, the story is set in Ireland sometime in the Middle Ages. It had me hooked from the very beginning and never let up until the perfect ending. So I offer a challenge to all who read this: Try a genre you've never read before. You just might be surprised. Glad you liked it! I'm always happy to share around some of the magic. I hope my own tome will have you just as riveted. I know it will rivet me! Hello from across the Tasman - I know what you mean about being from Downunder and missing all that EIBF fun! One day...? I'd love to read other genres but I never find the time.